Violinist William Preucil (left), taking a bow with the Cleveland Orchestra at a 2016 performance in Miami. But after the Washington Post published accusations made by violinist Zeneba Bowers, who alleged that Preucil aggressively kissed her, tried to undress her and pushed her down onto a bed after a 1998 lesson, Preucil was suspended from the Cleveland Orchestra on Friday. On Saturday, Preucil submitted his resignation to CIM. According to IRS filings, Preucil was among the highest-paid individuals at each respective institution. 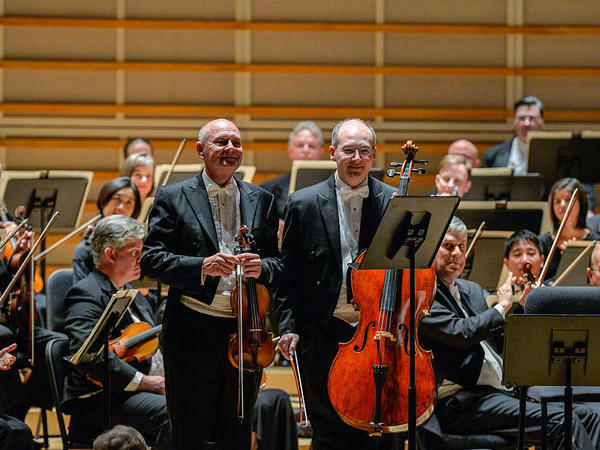 In 2017, as concertmaster of the Cleveland Orchestra, Preucil earned $579,030 — almost twice as much as the next most highly compensated musician at that symphony. At CIM, he was the school's highest-paid faculty member, earning $195,972 in 2016. The Washington Post reported on Sunday that Preucil has also been disinvited from scheduled upcoming performances elsewhere, including at the Grand Teton Music Festival in Wyoming, New Mexico's Santa Fe Chamber Music Festival and at the University of Texas at Austin. Two other men who were accused of sexual misconduct within last week's Washington Post article have also responded publicly. Bernard Uzan, a veteran artist manager and stage manager, was accused by four women of harassment, groping and inappropriate propositions. On Saturday, Uzan and his wife, Diana Soviero, resigned as the co-directors of the Florida Grand Opera's young artists program. Their departure came the day after Susan T. Danis, the company's general director and CEO, gave a statement to the Post in which she said: "Florida Grand Opera holds itself to the highest standard against sexual harassment. It is our obligation to ensure that every one of our employees feels safe, valued and protected. The alleged allegations are over a decade ago and Mr. Uzan remains to be a valued member to the ­company." Conductor Daniele Gatti has been accused by two women of attacking them in his dressing room; Gatti initially responded to the Washington paper by saying, in part: "All my life I have always been totally alien to any behavior that may be referred to [by] the term harassment, whether psychological or sexual. Every time I have approached someone, I have always done it fully convinced that the interest was mutual." On Saturday, Gatti issued a second statement about the allegations against him, this time through a crisis PR firm called Reputation Doctor: "To all the women I have met in my entire life, especially those who believe I did not treat them with the utmost respect and dignity they certainly deserve, I sincerely apologize from the bottom of my heart. Today and moving forward, I plan to focus much more on my behaviors and actions with all women. This includes women both young and old, to be sure no woman ever feels uncomfortable ever again, especially women that I work with in my profession in classical music. I am truly sorry."